So there's this thing called a strength finder test that I took when I first became a CA (known as an RA at other schools) as part of my training. My boss had us all go through our strengths and figure out what made everyone on the staff unique. One of the strengths the test returned for me (that no one else on my staff happened to have) was focus. I take great pride in my ability to identify what needs to be done, make a plan of action, and then take the necessary steps and focus my energy on making it happen. 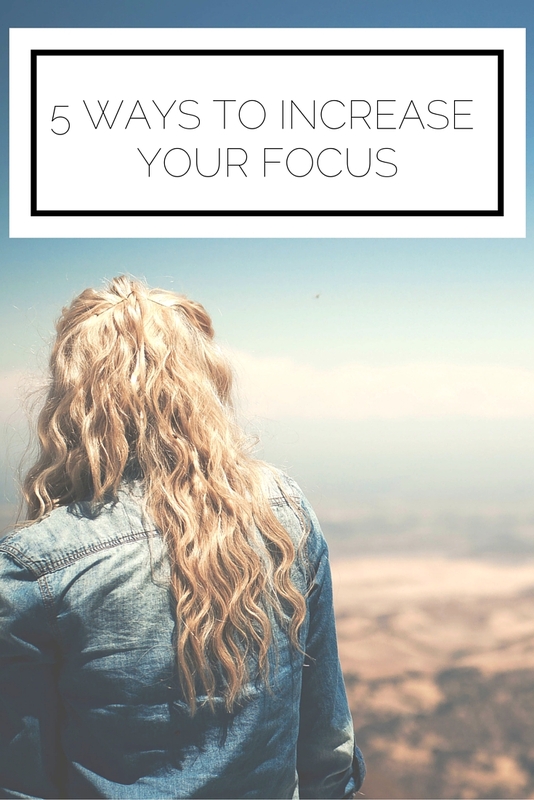 Today I want to share 5 ways you can make focus one of your strengths too! 1. Cut out the nonessential. I'm sure by now you know that minimalism is a big part of my philosophy on life. I truly believe that when you get rid of your physical possessions, digital clutter, and clear your mind, you make space for your best self and work to come to fruition. This is the first step to getting focused and producing amazing work. Since I do the majority of my school and blog work on my computer, I try my best to work on one task at a time instead of opening tons of tabs and jumping from one site to the next (Catherine has an awesome post on how she survived for a month with only one tab open. She's sort of my hero). 2. Put your phone away. Really. We all know the feeling of wanting to respond to incoming message and check our emails every ten minutes, but all this does is distract us from accomplishing what we need to and slows our process. It's incredibly easy to pick it up our phones for a quick scroll through Instagram, but resist the temptation (it really comes down to discipline). If you can't bear to turn your phone off, at least put it on "do not disturb" or "airplane mode" so you don't have to be continually interrupted. 3. Listen to music you can't sing along to. Perhaps this is just me, but when I listen to music I know, I just have to sing it! Even when I'm in the library I find myself humming along. To combat this, I've taken to listening to instrumental music or music I don't know the words to. I've especially been loving the seasonal Indie/Folk/Pop compilations from alexrainbirdMusic. Pick something that soothes and motivates you without being a distraction. Coffitivity is also a great resource for background noise to increase productivity and focus. 4. Prioritize when you feel overwhelmed. Sometimes you can be distracted just thinking about all that you have to get done. When you find yourself more focused on what needs to happen than on the reality of the task in front of you, you need to adjust your mindset. This is nothing revolutionary, but by writing down what's on your mind you can pick what items are most pressing and work hard to get it done. Sometimes accepting that you aren't superwoman and that you need to prioritize can do wonders for your focus. It's hard to do, but will free up your mind to do the best you can in the present. Oh yeah, thanks a lot Alyssa. Easier said than done, I know (trust me, I have experience with giving great advice to myself but not always taking it...). HOWEVER, your greatest power is your mind and the strength of your thoughts and resolve. Be kind to yourself and know that you are doing your best. What's more distracting than beating yourself up? Push aside those negative thoughts and just do the work. You've got this! How do you get yourself to focus?